Looking for a bright future? Want to gain excellent career opportunities? If yes, immigration to abroad would surely fulfil your career prospects. Most of the individuals especially from the developing countries choose to migrate to Overseas in seek of better career opportunities. Immigration to abroad in seek of employment entitles people to experience a high standard of life and wonderful future. There are various countries that seek eligible skilled immigrants to come to their respective countries to boost the respective country’s economy, as they are facing skill shortages. Some of the major countries that offer excellent career opportunities are Australia, Austria, Canada, Denmark, and Hong Kong. Here, we have provided some procedures to migrate to abroad for major counties for your reference. Australia is a land of opportunities, and every year some individuals aspires to migrate to Australia for better employment opportunities. Immigration to Australia is a point’s based system where an individual need to qualify in the Australian immigration point’s calculator to migrate to Australia. Canada is a leading immigration destination. The Canadian government has introduced some skilled immigration programs through which people can easily migrate to Canada. Immigration to Canada through skilled programs entitles them to stay in Canada permanently by obtaining Canada PR. However, to Apply Canada PR applicants must succeed in the Canada Immigration Points Calculator. Immigration to Denmark has become one of the most desirable options for overseas individuals in search of abroad career opportunities. To migrate to Denmark one of the best visa options is Denmark green card, which is a Denmark Immigration Points Calculator scheme. 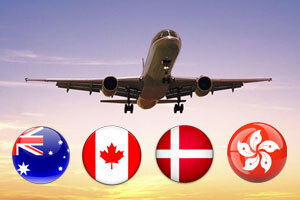 Applicants need to go through the points-based test successfully to migrate to Denmark. Applicant must secure 100 points in the following aspects. Hong Kong is becoming an emerging destination for immigrants for enhanced career opportunities. Immigration to Hong Kong under the Hong Kong QMAS is an entrant points based system seeks to allure overseas skilled individuals to migrate to Hong Kong and work over there to boost the country economy. Applicants need to meet the following requirements to apply for Hong Kong Quality Migrant Admission Scheme. Austria immigration under Austria red white red card is a point based system, where an individual should secure minimum pass points to migrate to Austria. The basic requirements for Austria immigration differ for each qualified person. Some of the eligible person’s even don’t require points based test to migrate to Austria via Red White Red Card scheme. The following are the eligible categories for Austria immigration.